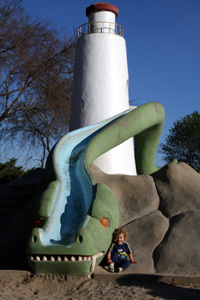 Remember when you were a kid and you’d go to the playground and pretend that the concrete tube was a giant whale whose stomach you had to slither through to get to freedom and the jungle gym was a giant octopus trapping you and you had to make a plan and escape and the slide was a sea serpent providing a daring getaway? And then you’d hear the goofy music tinkling from the ice cream truck and whatever was happening in the game, you were suddenly free so you could run over to the truck like your life depended on getting an It’s-It ice cream sandwich and maybe it did? Remember that? This Saturday, Friends of La Laguna, the L.A. Conservancy, and its Modern Committee are hosting a reservation-only, non-host, May Day Monster Mash family picnic of fun and games amidst the fins and the flippers. Your admission buys you lunch, games and the opportunity for freeze tag bragging rights . (Okay, maybe the sea creatures would win that one.) Even better, the Coolhaus truck, beloved by kids of all ages, will be handing out “architecture-inspired” ice cream sandwiches as part of your treat. And unlike when you were a kid, you can just mosey over to get one because your game will still be waiting for you. But you can run really fast if you want to…. Previous Post VAUD & THE VILLAINS @ Fais Do-Do: Put the little ones to bed, sugar, and let your hair down. Wow what a great discovery !! Kim how do you find such an amazing variety of events? Thanks, Jeri! Miles of internet to go go before I sleep each night!